Can I Eat My Cheddar Cheese Past the Code Date? Homemade cheddar cheese can take on a wide array of flavors. 1 Can I Eat My Cheddar Cheese Past the Code Date? 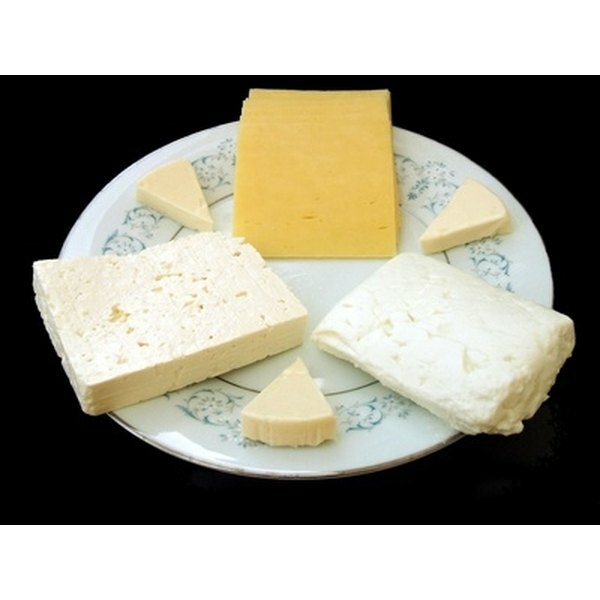 4 What Are the Health Benefits of White Cheddar Cheese? Cheddar cheese is a semi-hard, yellow-orange cheese that varies in sharpness. It is named after an English village called Cheddar and is widely popular in the United Kingdom. With some simple tools and ingredients, you can produce your own cheddar cheese at home. Heat the milk to 88 degrees in a large pot. Stir in the buttermilk. Let it sit for one hour while maintaining the 88-degree temperature. This can be accomplished by letting the pot sit in a sink partially filled with warm water. Add rennet, which contains a proteolytic enzyme, which coagulates milk and divides it into curds (solids) and whey (liquid) into the cool water. Stir the water-rennet mixture into the milk for 30 seconds. While maintaining the 88-degree temperature, let the mixture sit for 45 minutes. During this time, the milk will separate into liquids and solids. Cut the curds into small cubes and let them sit for 20 to 25 minutes. Slowly stir them for 30 to 45 minutes while gradually increasing the temperature to 98 degrees. Strain: Once the curds have settled to the bottom, pour out the excess liquid. Strain the curds in a colander for about 10 minutes. Pour the curds back into the pot, add the non-iodized salt and mix well. Let the pot of curds sit in warm water for one hour. Stir frequently. Line the press with cheesecloth. If you do not have a press, you can make one by cutting both ends off of a large coffee can. Cheesecloth can be improvised from a clean pillowcase. Pour the curds into the cheesecloth. Place a wood follower on top of the cheese and apply 15 lbs. of pressure for about 20 minutes. To apply pressure, consider wrapping bricks in aluminum foil. Redress the curds in new cheesecloth. Cover with the wood follower and apply 30 lbs. of pressure for two hours. Redress the curds in new cheesecloth, cover with the wood follower and apply 30 to 40 lbs. of pressure overnight or for at least eight hours. Remove the curds from the cheesecloth and allow them to air dry for three to five days. Turn the curds frequently to allow all sides to dry evenly. Coat the curds in cheese wax. Age for two to six months at 55 degrees. The longer the cheese ages, the sharper the taste will be. For very sharp taste, age for approximately one year. Basements, cellars and non-working refrigerators are ideal environments for aging cheese. How Long Can You Keep Lemon Slices in Water?